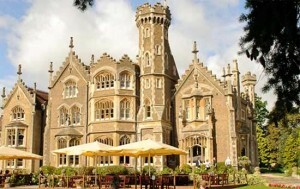 The ILC international cost review was carried out at Oakley Court in Windsor, UK, where the “Rocky Horror Picture Show” was filmed in 1975. The final deliverable of the Global Design Effort, the ILC Technical Design Report, was completed and submitted in draft form to the International Linear Collider Steering Committee (ILCSC) in November 2012. Following a successful technical review in December, an international cost review of the TDR ILC value estimate was chaired by Norbert Holtkamp of SLAC in February. The total TDR value estimate averaged over the three regional sites is 7.8 BILCU (Jan 2012 US$), plus an explicit labour estimate averaged over the three regional sites of 23 million person-hours. The international cost review validated these TDR value estimates, as well as pointed out other costing that will be needed as the ILC becomes a site-specific construction project. Costing international projects, like the ILC, is a particularly challenging undertaking. The project will involve the collaboration of countries from around the world that all have different traditions and conventions for planning and cost-estimating large projects. The “value” methodology, which we have adopted for the ILC, is independent of any particular country-specific system, while being compatible with conversion to any such system. Value is an especially useful concept for dividing up a project where collaborators mostly contribute equipment “in kind,” because of the large differences in manufacturing costs and in labour rates around the world. Converting value estimates to country costing is accomplished by adapting to the local costing practices. The ILC TDR value estimate is for a machine of 500 GeV centre-of-mass energy, but includes some items rated for 1TeV to enable a later energy upgrade. The reference currency (the “ILCU”) is the United States dollar (USD) as of January, 2012. A very important consideration is how to relate the currency in one country to that in another for providing the goods and services in an international collaboration. In order to eliminate regional price distortions related to exchange rates, conversions from other currencies to ILCU are based on purchasing-power-parity (PPP) indices published by the Organisation for Economic Co-operation and Development (OECD). The ILC TDR value estimate gives the resources required to build the ILC, as described in the Technical Design Report. We expect that the project will be supported by a mixture of cash and in-kind contributions from a collaboration of countries around the world. The ILC TDR value estimate should allow funding agencies in nations that are considering in-kind contributions to the ILC project to assess the nature and scope of resources needed for their part of the project. We provide detailed information on the cost basis, drivers and trade-offs that can be used in the pre-construction phase for further cost-optimisation of the project through value engineering and R&D. 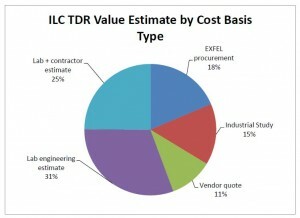 An illustration of the cost basis by type for the ILC TDR value estimate. Value (in terms of currency units) for items procured from vendors. The value of a component is defined as the lowest reasonable estimate of the procurement cost of an item with the required specification and in the appropriate quantity, based on production costs in a major industrial nation. Labour (in terms of person-hours). In this context, Labour is defined as “explicit” labour, which may be provided by the collaborating laboratories and institutions, or may be purchased from industrial firms. This to be distinguished from a company’s “implicit” labour associated with the industrial production of components and contained (implicitly) within the purchase price. The total TDR value estimate for the cost of the ILC design as will be presented in the Technical Design Report, averaged over the three regional sites, is 7.8 BILCU, plus the explicit Labor estimate, averaged over the three regional sites, is 23 million person-hours. We estimate the uncertainty in these costs at this stage of the project at about 24%. (The estimates above include the small changes recommended by the cost review committee). The cost chapter of the TDR will contain details of these costs by subsystems and will be released as part of the TDR in June. Assess the methodology and costing guidelines used for the TDR cost estimate, including the use of Purchasing Power Parity to convert regional currencies to a common ILC unit. Evaluate the reliability and robustness of the estimate, together with its associated uncertainties, for the baseline 500 GeV machine. Assess the quality and completeness of the cost estimate. Evaluate the procurement and industrialisation models used to establish the estimate. Review the proposed project schedule, taking into account the tasks and manpower required each year. Assess the list of the cost drivers to be addressed through future R&D and value engineering. Comment on the cost estimates for a 250-GeV machine, a 500-GeV machine with a luminosity upgrade, and a 1-TeV machine, together with the assumptions that underlie them. In addition, the committee went beyond the charge. “Develop a plan for the next (transitional) phase of engineering design leading to readiness to start construction. Develop key deliverables and prioritized activities and milestones needed for start of construction. Seek funding for these activities and support for sufficient manpower commensurate with a project of this magnitude. Create a resource-loaded schedule that takes into account the comments in this report, and re-evaluate the manpower distribution, capital needs and space requirements. Conduct site-specific engineering studies to a level allowing construction to start. Update the cost estimate and schedule with key missing items. This important review provided validation of the value costing in the TDR, as well as very useful guidance for the future. The combination of the Cost and Technical Review were discussed by the ILCSC on 21 February in Vancouver, and as a result they have approved the TDR, conditional on our making a few specific changes recommended by the reviews. We are now incorporating those changes and, as a result, we remain on track to complete the TDR as planned for release in June. I end today by noting the terrific job of leading the GDE costing effort by Gerry Dugan (Cornell), who led the effort and the successful review of the ILC value costing that will now be incorporated into the TDR. 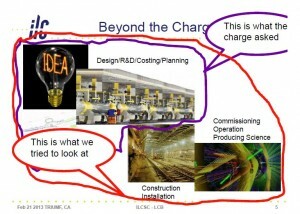 More explanation of the ILC value costing can be found here.